So I decided to make myself some popcorn as a treat. Popping my own kernels made this totally within the rules, and to make it a little more interesting I added some curry powder and chili powder to the melted butter. The spice gave the popcorn a really nice kick. I could have eaten it all day. Coat the bottom of a large pot (make sure you use one with a lid) with the oil. Add the kernels, cover and turn on heat to medium high. Let the pan heat till you start to hear kernels popping, then lower the temp to medium. Shake the pot occasionally until you don’t hear kernels popping anymore. The whole process takes 5 to 8 minutes. Transfer popcorn to a large bowl. Add spices to butter then drizzled over popcorn. I like the layering method to ensure even popcorn coverage. Popping the kernels yourself is the only way to go…it’s so much better than the bagged options and leaves room for awesome seasonings like this one. I love it! Hope it was the perfect treat to calm your cravings :) I seriously cannot imagine a gluten free diet…I’m too much of a carb lover! You are strong, girl! Adding spices and things to popcorn was a teenage hobby of mine. Shake-on Parmesan, Old Bay, brewer’s yeast (not my favorite), you name it. I’m going to have to break out the curry powder for our next movie night. Thanks for sharing. You have willpower, my friend! 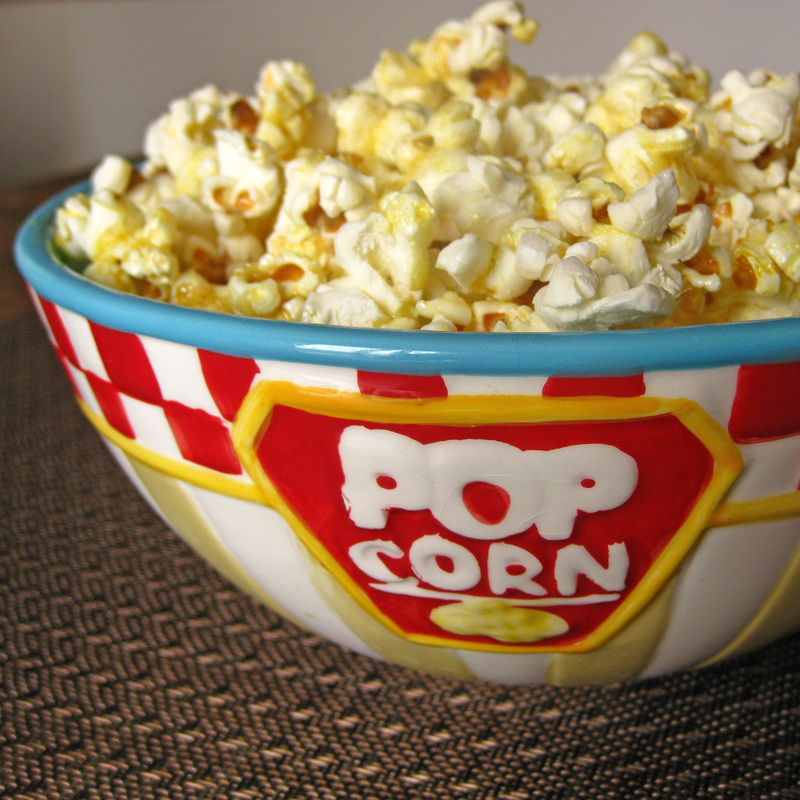 Fantastic popcorn recipe – thanks for sharing this great idea. Mmmm! Curries popcorn is a BRILLIANT idea! I completely admire that you’re going sugar-free. I’m so sensitive to sugar–I crave the stuff, have a little bit and want more. It’s terrible around Halloween! Curry powder on popcorn sounds delicious. A perfect snack solution! Like you I love popcorn but have always popped my own. I use virgin olive oil because it adds a touch of flavor. Then add the (real) butter and spices! The curry is a great idea. I posted a spice blend for popcorn that has chili powder and oregano in it along with a few other things. Also yummy on vegetables. I love popcorn, and I like making it from scratch way better than microwave popcorn. But I think the addition of curry and chili is inspired! I never would have thought of that. Yum – garlic salt, sage, and chili powder are also really great on popcorn, but curry I’ve never tried. Thanks for the tip! I love spicy popcorn too and curry spice is so delicious especially when it has some heat! Yum! Fun twist on popcorn. The spices are a great addition. Isn’t making your own popcorn so much tastier than the bagged stuff? While I’m not really a popcorn fan, this might do the trick for the craving. I really should join you on this challenge. I’ve done it once before also and have lost control again. You’ve got me thinking! I eat a lot of popcorn and often add flavorings; but I’ve never tried an Indian version. What a great idea – I’ll definitely be giving this one a try….maybe with the addition of a tiny bit of cayenne. Thanks for the idea and keep up the good work with the gluten free diet – I can’t imagine what a challenge it must be. What a great combo of flavors!!! Yum! I love popcorn too. I have an air popper, which I use all the time. I’ve never tried curry powder — sounds delicious! I’ve seasoned mine with Japanese Furikake and butter — they sell popcorn like this in Hawaii, called Hurricane Popcorn. It’s really fattening but delicious. So I make my homemade version lighter — air popped pop corn, some butter spray and the furikake. It’s really delicious! I really need to pop my own kernals I think the popcorn would be so much better! I am a new follower!